The cost of Mechanical Concrete® is geared to the cost of tire-derived-geo-cylinders. 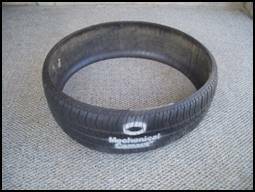 Tire-derived-geo-cylinders, TDGC, can be purchased anywhere in the US in one-half lane mile, project quantities (approx. 2 truckloads) for $2.00 each plus freight. Freight costs run about $0.05 per cylinder depending on the project location. 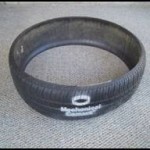 Project quantities of TDGC are supplied through designated tire-recycler manufacturers. TDGC in smaller quantities can be purchased through licensed dealers and cost $3.00 each plus freight. Canadian prices are slightly higher but comparable. Stone prices depend on local market prices. What is this price compared to? The only comparable confinement technology are high-density polyethylene honeycomb geocells. On a square foot basis, in project quantities, Mechanical Concrete® tire-derived-geo-cylinders cost at least 50% less than the cost of geocells. Plus they are stronger and easier to install. With a collection of tire-derived-geo-cylinders almost anyone can construct an industrial strength Mechanical Concrete® road base with 8 inches of crushed stone that will last longer and require less to maintain. This is a road base that will not rut, pothole or wash out under most use and weather conditions. This is why Mechanical Concrete® is not only technically superior, greener and simpler to use but it’s also the least costly alternative by almost any measure.